Most higher education institutions have to deal with some form of financial aid disbursement for their students. 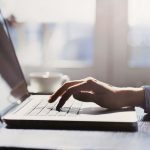 The financial aid process usually involves many different forms and supplemental documents that must be processed, reviewed and approved by multiple people. Here are three ways to reinvent this time-consuming and paper-intensive financial aid process. The current generation of college students is used to having information available on demand. 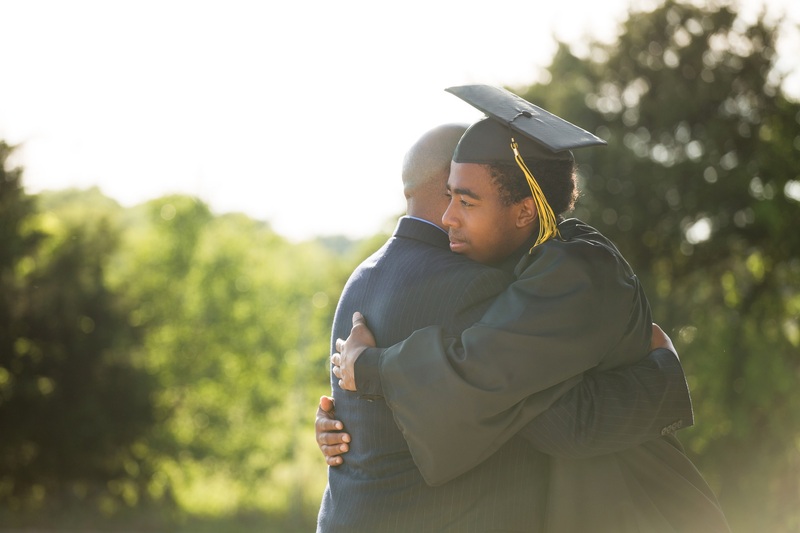 Why should financial aid forms be any different? Palm Springs, CA-based College of the Desert has an online student portal where all financial aid forms are electronically available. Students no longer have to stand in a long line at the financial aid office just to obtain a blank copy of a form. 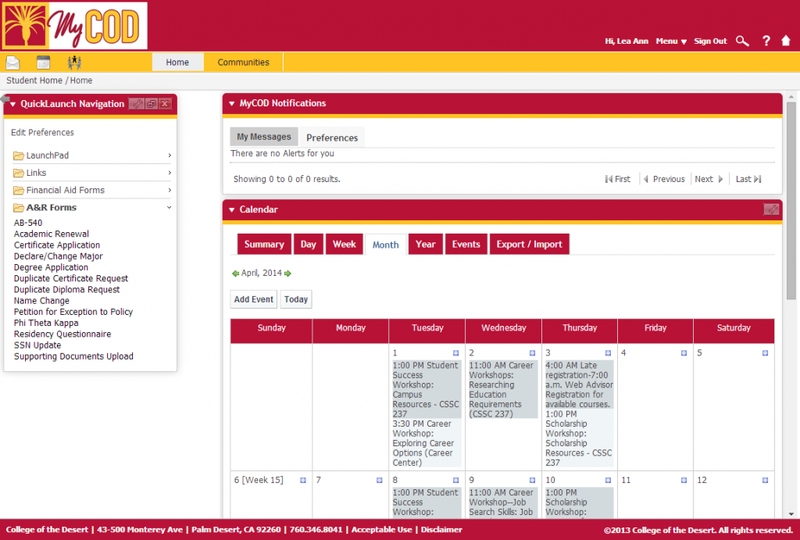 College of the Desert’s online student portal. These forms can be linked to the student database so that most of information in the form is prefilled once a student types in his student ID. Certain fields can be set as required to be filled out before the form is submitted. Counselors don’t have to follow up with students to correct or receive missing information. Lines in the financial aid office are reduced, giving staff more time to process information. It’s important to keep the line of communication open between everyone involved in the process, including the students, counselors and other reviewers. Oklahoma Christian University provides an online financial aid checklist on its student portal, which is updated when new forms are submitted and lets students know exactly what is missing. 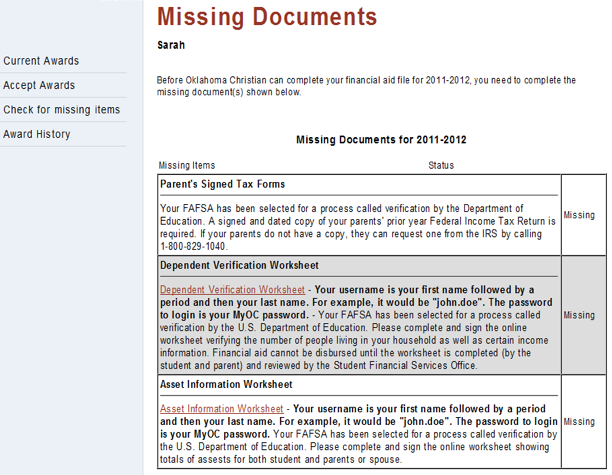 Oklahoma Christian University’s online financial aid checklist. Students can also choose to be automatically notified by email when documents are missing, or when their documents are reviewed and approved. Financial aid counselors are notified of new forms that require their attention and receive reminder emails if they do not review them in time. Fielding inquiries from students and parents regarding the status of financial aid is something many financial aid counselors do regularly. Trying to find the appropriate student file can make responding to these questions time consuming and inefficient. Tarrant County College District (TCCD) faced this issue with students applying for Veterans Administration (VA) benefits. TCCD now stores all student records, including VA benefits forms, in an enterprise content management (ECM) repository, which is synced with the school’s enterprise resource planning (ERP) system. Now, VA district representatives can access student forms by performing a quick search in the ECM system, improving response time to student queries. 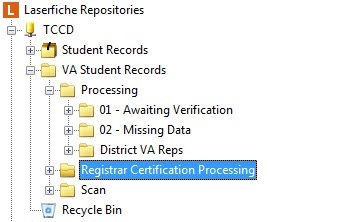 Tarrant County College District’s VA benefits folder structure. Learn how other higher education institutions have reinvented their business processes in this free eBook: Quicker Better Safer: Higher Education.